For those who only know the Brussels neighbourhood of Molenbeek-Saint Jean from newspaper headlines at the time of the terrorist attacks on Paris and Brussels, peace may not be the first word that comes to mind. It may therefore come as a surprise that Molenbeek-Saint Jean should be the venue of an exhibition of Cartooning for Peace. The exhibition was giving the Together label, the UN-led campaign as it was in the spirit of combatting stereotypes and promote respect and dignity for refugees and migrants. Cartooning for Peace is a great example of how dialogue and arts can be used to connect people in the spirit of leaving no one behind. “Connecting people – Cartoons for peaceful coexistence”, is in fact more than a display of drawings, since cartoonists from France, Belgium Tunisia, Syria and Israel worked with youth in curating it and engaged and debated with the pupils from local schools. 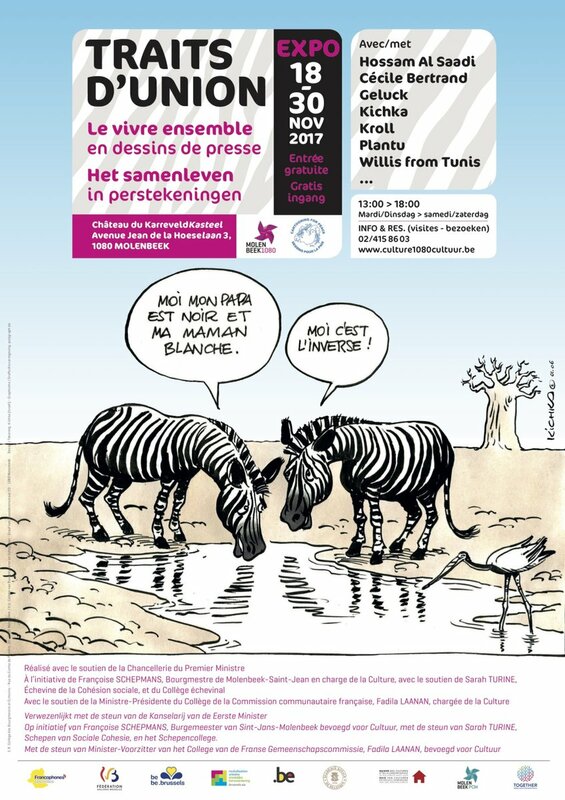 The exhibition of 30 press drawings took place 15-30 November in the Château du Karreveld, in the midst of a park with a peaceful lake in Molenbeek, another reminder of how misleading stereotypes can be. The cartoons were organized according to themes such as stereotypes, dialogue and liberties, or migration and solidarity, a theme cartoonists Zlatovsky from Russia and Geluck from Belgium approached from different perspectives. The former studies this event with a critical eye showing how some Europeans can be hostile to migration, while the Belgian uses humour to show the absurdity of some of the narratives attached to migrants coming in Europe.